Unison and Harmony: Are the Members of the Trinity Equal? As a vocal music major in college, I was required to participate and sing in a wide variety of groups. There was the annual oratorio choir and orchestra, the college chorale, and a smaller select group called the Chamber Singers. At various times I toured and concertized with all of them, sometimes as a tenor, though more often later as baritone/bass. There was a regular sort of competition that went on among the voice parts as to which was the best and most important. The sopranos were often a bit high and mighty (pun intended); and while carrying the melody most of the time (though not always) they perceived themselves as the most indispensable. I always thought the bass section had a strong argument as saying that they were the foundation of the chordal structure upon which all else musically rested (though colorful chord inversions messed with this theory – just went music geek on you there). And the altos and tenors would argue that they were responsible for the bulk of the harmonies that made a choral production colorful and beautiful. The fact is of course that all of the parts were necessary, and though they played different roles, none was more technically important than the others. The strength expressed in unison singing brought power to a composition, whereas the delicate harmonies contributed a rich context of refinement. We may apply this to the discussion of the roles of the Trinity, though as with any and all natural world explanations, it will fall short of fully illustrating the impossible to completely grasp and comprehend. 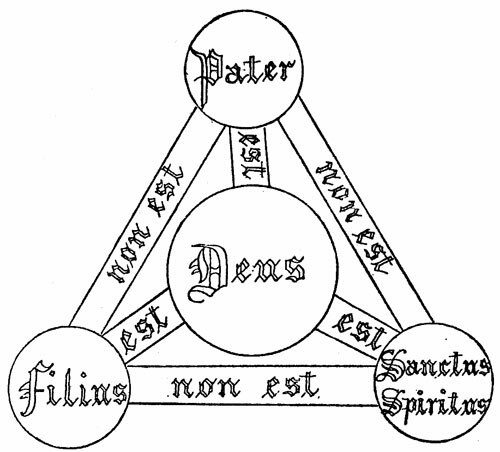 The members of the Trinity are co-equal and co-eternal. There is equality, yet mutual submission in the roles each plays. You can probably figure it out, but a translation would roughly say: The Father is God, The Son is God, The Holy Spirit is God; God is the Father, God is the Son, God is the Holy Spirit; The Father is not the Son, The Son is not the Father, The Father is not the Holy Spirit, The Holy Spirit is not the Father, The Son is not the Holy Spirit, The Holy Spirit is not the Son. Now doesn’t that just clear up everything? In biblical study there is a discussion called the theology of procession. This says that the Father sends the Son, and the Father and the Son send the Spirit. That might seem to suggest that the Father is most important, whereas it speaks of the relationship that exists in terms of function. There is yieldedness within the Trinity. Again, illustratively – is the husband greater than the wife? It speaks in the Scripture of headship for the husband, but he is not greater. Likewise, are certain gifts and positions of service in the church better than others – the speaking gifts better than the serving gifts? No, not really. All parts of the body are necessary and needful. The Trinity is a model of diversity of roles, yet unity of essence and purpose. This entry was posted in Him Alone and tagged Equal Members of the Trinity by Randy Buchman. Bookmark the permalink.